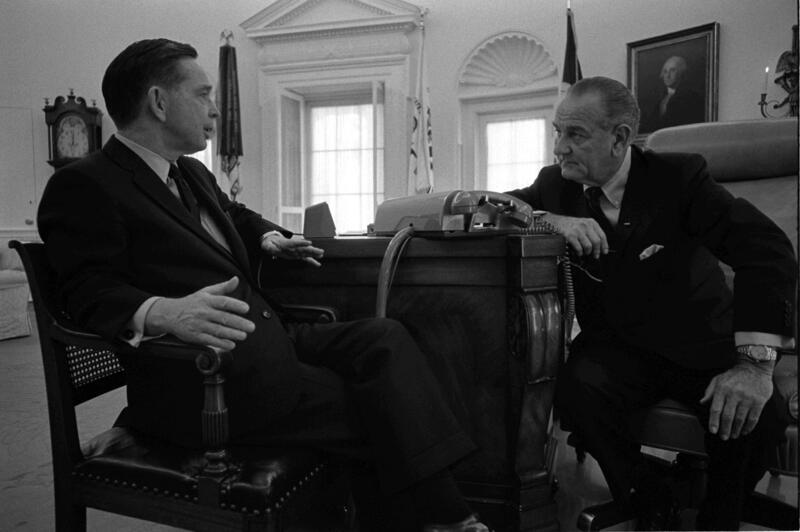 House Majority Leader Carl Albert (D-Okla.) sits in the Oval Office with President Lyndon Johnson. Despite the backlash against the Democrats over civil rights in the 1960s, despite the Reagan Revolution, and the ensuing culture wars, for years a Republican trying to run for local office in Little Dixie utterly wasted his time and money. But over the past decade, that Democratic dominance has completely collapsed. The question isn’t really why this part of Oklahoma turned away from the Democratic Party, but why it took so long? Bob Blackburn, the executive director of the Oklahoma Historical Society, says the roots of Oklahoma’s political history extend far beyond statehood, or even the territorial land runs of the 1880s and ‘90s. The seeds of southeast Oklahoma politics were planted by Oklahoma’s Native American tribes. All five major tribes side with the Confederacy during the Civil War. Their ties to the south would help shape Oklahoma’s view of the federal government through statehood, and beyond. “The mythology along with a little bit of the reality, is that the Republicans — Abraham Lincoln — invaded the south, and the lost cause was trying to save the purity of the Constitution, state’s rights, their ability to leave the Union, that without the Republicans and without Abraham Lincoln they would have their own nation,” Blackburn said. So, the Republicans were the enemy in the eyes of the people in what would become Oklahoma during and just after the Civil War. And Republicans ran the federal government. And this idea of the “lost cause” of the Confederacy was shared between the Indian people in the territory and the wider south, which was loyal to the Democratic Party at the time. Fast forward to the lead-up to statehood in 1907. Indian Territory — eastern Oklahoma — petitions to be its own state, called Sequoyah, and is denied, in part because Sequoyah would be a solidly Democratic state. The relatively low population in western Oklahoma would thin further once that fertile farmland dried up and blew away during the Dust Bowl. Urban, at the time, meaning more Republican. So southeast Oklahoma was poor and jobless. Those left behind needed a hero. They got one. 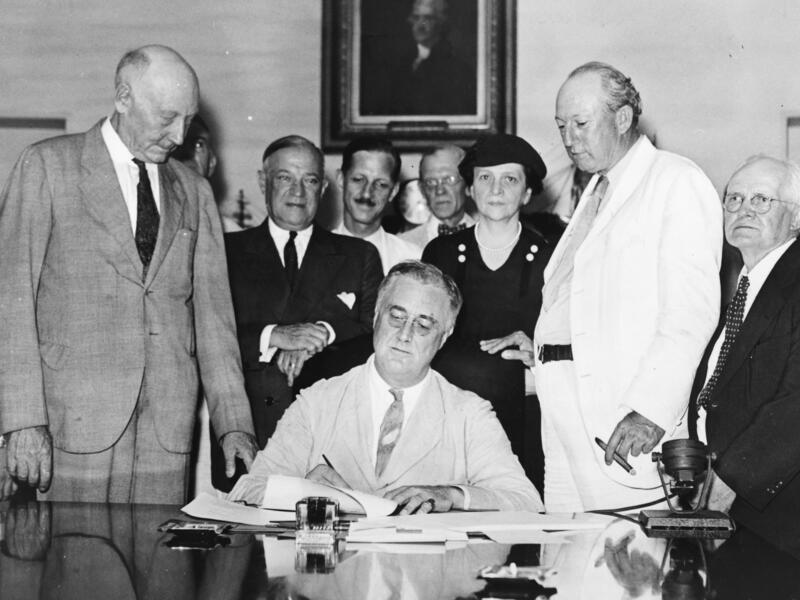 President Franklin Roosevelt signs the Social Security Act on August 14, 1935. Franklin Roosevelt’s impact would be felt in Little Dixie’s politics for the next 70 years. Kenneth Corn, a former state Senator from Poteau and the Democratic nominee for lieutenant governor in 2010, wrote his senior thesis on FDR’s impact in southeast Oklahoma. The dispossessed rural population took to the New Deal far more positively than the rest of the state. Gaddie called the New Deal “living memory” because of social security, unemployment insurance, and the fact that for thousands of war veterans, Roosevelt was their president. “That stuck in their minds, that government could be a force for good and could do great things,” Gaddie said. President Johnson continued the legacy of the recently assassinated President Kennedy when he signed the Civil Rights Act of 1964 that outlawed discrimination based on, among other things, race. After the signing ceremony he reportedly said Democrats had lost the south for a generation. And it was true, for Oklahoma too. Oklahoma’s electoral votes in the 1968 presidential election went to Richard Nixon, and the state hasn’t been “blue” since. But in Little Dixie, things were different. In that 1968 election, Hubert Humphrey, the Democrat, won in Pittsburg County, where McAlester is. Humphrey won in Coal, Hughes, and Latimer Counties as well, all in Little Dixie. Gerald Ford took the state in 1976, but in Little Dixie, Jimmy Carter won by a landslide. In 1980, Reagan got trounced in southeast Oklahoma. Hughes, Coal, and Haskell Counties went for Walter Mondale in 1984, when Reagan won in 49 of the 50 states. Imagine this: Michael Dukakis beats George H.W. Bush in 1988 in Little Dixie. And of course southeast Oklahoma voted for Bill Clinton both times. In southeast Oklahoma, Democratic dominance survives the civil rights backlash. It survives the Reagan Revolution. It survives the culture wars of the late 1980s and early ‘90s. Resentment over the Civil War, coal mining, unions, European immigration, Franklin Roosevelt and the New Deal – all these factors made Little Dixie so loyal to the Democratic Party in the first place so that by the end of World War II, the stage was set for the rise of a handful of political leaders that would transcend the national forces working against the Democratic Party. Perhaps chief among all of the influential political leaders from southeast Oklahoma was Robert S. Kerr, first a successful oilman, then governor of Oklahoma, then Democratic U.S. Senator from Oklahoma. He went from Ada to one of the most powerful people in the country. Kerr saw the importance of infrastructure. Oklahoma has more lakes than any other state in the country. That’s true. And none of them are natural. All of them are man-made. And Kerr is one of the main reasons they’re there – he transformed the geography of Oklahoma with the sheer force of his political will. He pushed for, and got, the massively expensive Kerr-McClellan Arkansas River Navigation System put in place. It’s the furthest inland deep-water port in North America and connects Oklahoma to the Gulf of Mexico. Former Gov. George Nigh also hails from Little Dixie. He’s nearly 90 years old, and worked with Kerr when he was growing up in McAlester in the 1940s and 50s when Kerr ran for president. He knew “the king of the Senate” intimately, and the “little giant” on the other side of the U.S. Capitol – Representative, then Majority Leader, then Speaker Carl Albert. 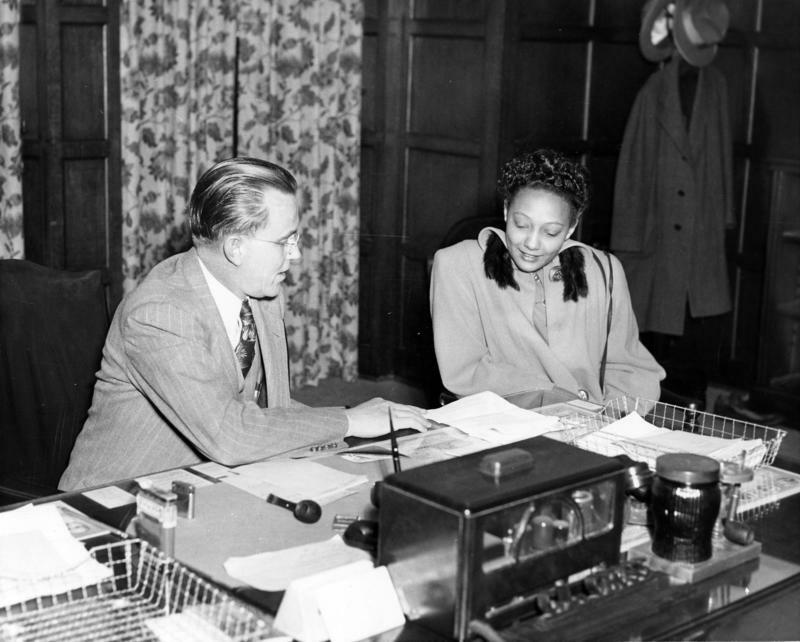 Nigh said in the 1950s and 60s, Oklahoma and Texas pretty much ran Congress. 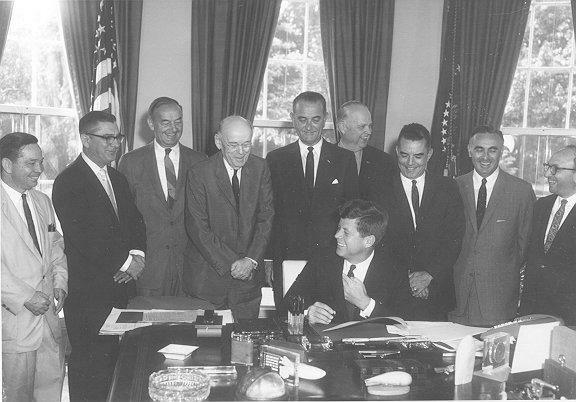 President Kennedy signs amendments to the Social Security Act on June 30, 1961. Standing on the far left is Carl Albert, and Robert S. Kerr is just behind and to the right of Vice President Johnson. When Little Dixie had a voice that big, there wasn’t much of a reason to vote Republican. Even after he retired, Albert retained his long political reach, helping David Walters defeat Republican nominee Bill Price after Republican Gov. Henry Bellmon chose not to seek reelection in 1990. 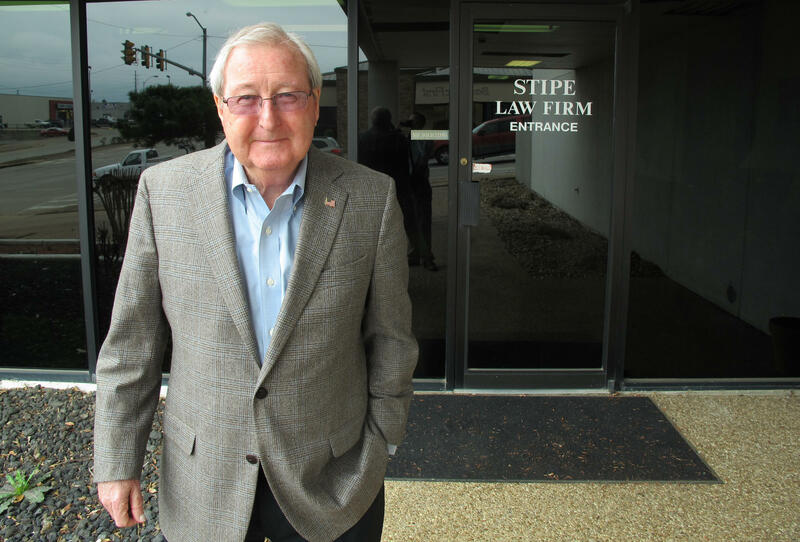 Carl Albert and Robert S. Kerr were national leaders, but Gene Stipe made Little Dixie his kingdom in state politics. He represented McAlester in the state Senate for 46 years from 1957 until 2003. He became a legendary man of the people who’d help his constituents any way he could, as long as there was something in it for him. Editor’s Note: Layden started his radio career at KNED in McAlester, a Stipe-owned station, and his family was very close to Stipe before he passed away in 2012. Eddie Harper stands outside Stipe's law office in McAlester. But Stipe was far from selfless, and he had lots of enemies, and scandals. The feds came after him for tax evasion. There was a dust-up about ghost employees at the state health department office in Pittsburg County and improper campaign contributions. He was no friend to the news media either, and felt the bad press he got in The Oklahoman newspaper was part of a personal vendetta against him. Still, she can’t deny how he endeared himself to his constituents after seeing him speak at a Savanna High School graduation ceremony. And then, in 2003, it was over. Stipe pleaded guilty on federal campaign violations and resigned from the Senate on March 11. It’s no coincidence that it was around the same time that the Democrats finally lost their grip on Little Dixie. Les and Ruth Brelsford, Democratic Party organizers in Latimer County, Okla. The Democratic foundation in Little Dixie started to crack in the final decade of the 20th century. Term limits went into effect in 1992, keeping politicians like Kenneth Corn from becoming the next Gene Stipe. The Republican Revolution of 1994 saw Tom Coburn and J.C. Watts takeover formerly Democratic seats. Also that year, Oklahoma’s Congressional delegation lost a politician Gaddie says approaches the stature of Kerr or Albert. Little Dixie had always been very socially conservative, but having highly influential national, state, and local leaders trumped those leanings until the turn of the 21st century. 12-year term limits wetn into effect in 1992, about the time a new group of young Little Dixie Democrats would’ve started their legislative careers. When it came to Poteau state Sen. Kenneth Corn, the strategy hit its mark. Corn is now the city manager in Anadarko, and agrees the political machine these leaders built in Little Dixie ended with Gene Stipe’s political career, and term limits kept their successors from taking a political hold on the area. Oklahoma Democrats have always been conservative, and those conservative to moderate politics don’t translate well to Washington Democrats. When voters sent Barack Obama to the White House in 2008, that split between Oklahoma Democrats and Washington Democrats became a chasm, and a reminder of Little Dixie’s post-Civil War roots. Brenda Callahan is the vice chair of the Democratic Party in eastern Oklahoma’s Second Congressional District. That’s the seat Democrat Dan Boren used to hold, but now belongs to Republican Markwayne Mullin. Callahan also sees the loss of influential leadership as the main reason Little Dixie finally turned away from the Democrats, but she too points out the role racism and the election of Barack Obama played, especially for older voters. And in Pittsburg County, the oldest voters are the most Democratic. She pulls out a big pile of voting records from consistent Democratic voters in the McAlester area and sending mailers to the youngest of them. “82, 71, these are our regular voters. 88, OK? 73. 84, 81, here one at 57. I sent them a letter. Ok? 84, 86, 72, 75 72,” Callahan said as she read off their ages. What’s left of the Democratic Party in Pittsburg County is dying, and the ones that are still around generally hate President Obama. 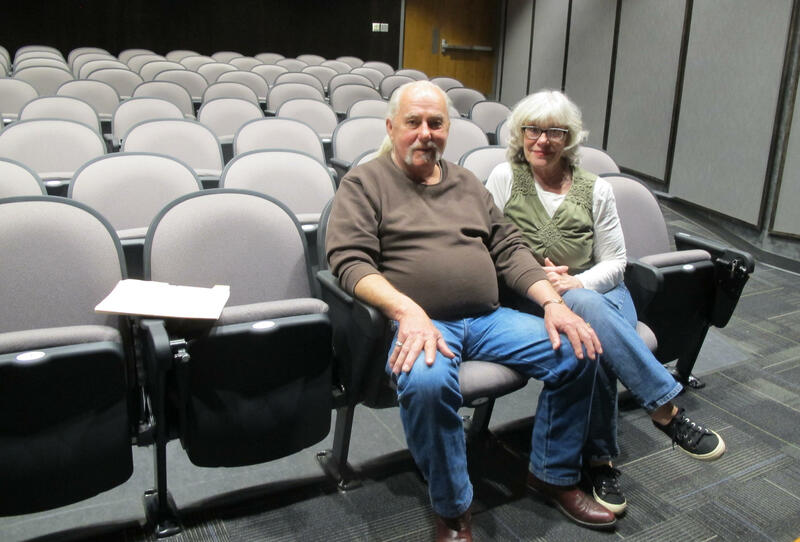 In Wilburton, Latimer County Democratic Party organizers Les and Ruth Brelsford say racism may have played a role in 2008, even if no one would admit it. But there’s one more aspect at work. In 2006, researchers Stefano DellaVigna and Ethan Kaplan published a working paper called “The Fox News Effect: Media Bias and Voting.” It found that in the 2000 presidential election, the presence of the Fox News Channel in a town’s cable lineup equated to about a half a percentage point bump in Republican gains compared to the 1996 election. Maybe it’s not a coincidence that Fox News premiered around 1998 in towns across Little Dixie, right when this trend toward the Republican Party took off. The Brelsfords certainly don’t think so. Corn also says the rise of the Fox News Channel changes the way people in the area get their news, as playing a part in withering support for Democrats in southeast Oklahoma. The loss of great Democratic Party leaders and the death of the old Democratic political machine, term limits, racism and the election of President Obama, the rise of conservative media on television — all of these different factors converged on southeast Oklahoma at the turn of the 21st century, and relatively quickly, wiped out the progressive dominance that took a century to put in place and the likes of Carl Albert, Robert S. Kerr, and Gene Stipe to maintain. It’s a fascinating story, and every Democratic Party activist I talked to said there would come a day when Little Dixie would be solidly Democratic again. Democrats do still hold a 3-to-1 voter registration advantage in Pittsburg County, for example. But those Democrats are voting for members of the other party, like Larry Boggs, a Republican, who now sits in Gene Stipe’s old state Senate seat. Next week marks the third anniversary of an incredibly consequential U.S. Supreme Court decision that struck down key provisions of landmark civil rights legislation. The high court’s 5-4 ruling in Shelby County vs. Holder meant that Alabama and many other southern states no longer had to seek federal approval to change their election laws under the Voting Rights Act. But what happened, and how we got there, is so much more complicated. 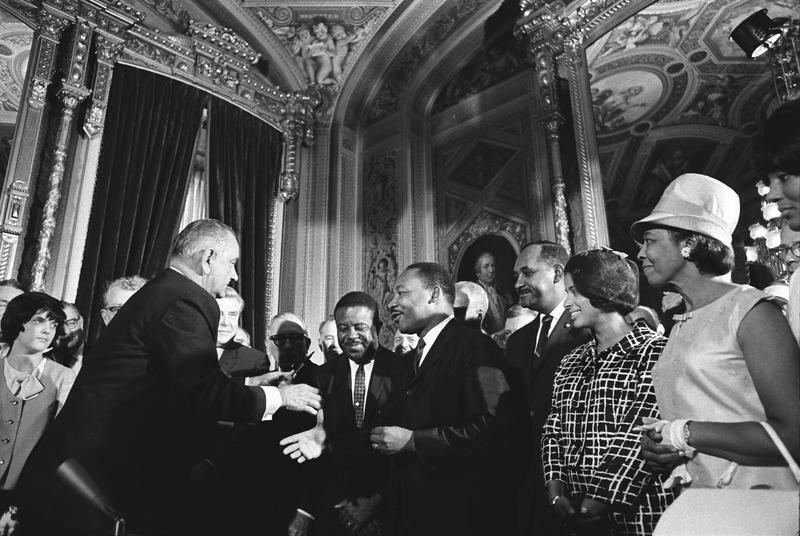 To really understand the narrative arc of the 1965 Voting Rights Act, you have to go back 100 years to the end of the Civil War and the three so-called “Reconstruction Amendments” to the U.S. Constitution. The 13th, 14th and 15th Amendments outlawed slavery, established citizenship for blacks, and gave them the right to vote.